7 New Warm Grey Tones of Montana GOLD out now! The Montana GOLD range has well and truly earned it’s place in the studio’s and creative spaces of artists, artisans and Do It Yourselfers the world over. 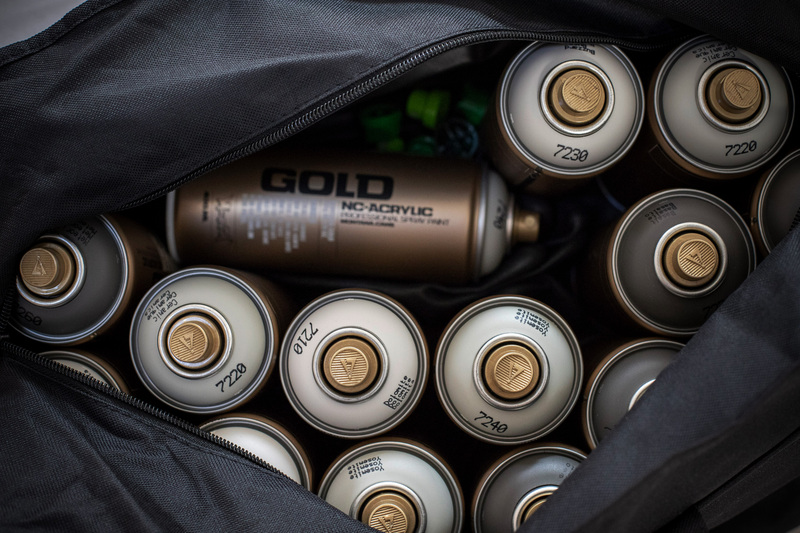 With a color range that had 215 of the most impressive and compatible colors available in spray paint, we were aware that with ever increasing demands and changing trends, that there was still room for improvement in this almost perfect family. We called on our worldwide network of artists in conjunction with our product development team and of course the best Lab Nerds in the business. The objective, to create what we think are the keys to the perfect complimentary greyscale. Please give a warm welcome to the newest members of the Montana GOLD color pallet; Dolomite, Ceramic, Buzzard, Yosemite, Asphalt, Meteorite and Basalt. As the popularity of grey tones continues to rise, choosing the right tones to warm up an already comprehensive grey pallet was no easy task. But these 7 new additions are the perfect addition, to a now perfect family. With no exceptions for quality and precision, the new Montana GOLD grey tones exhibit the same exceptional opacity and coverage that users expect. The addition of these 7 warm, innovative grey tones creates a world of possibilities. Not only in regard to the colors individually or in relation to each other. But also in conjunction with the pre-existing grey tone pallet that was already leader in its class. With a grey tone for every occasion, it doesn’t matter if your a professional or working at home in your garage. Every project can be well planned by visiting the Montana GOLD color chart on our website where HEX codes, CMYK and RBG values can be selected in fullscreen, at the click of a button. Go and try the NEW Montana GOLD warm grey tones for yourself now! Named after the famous mountain ranges North Eastern Italy, Dolomite captures the essence of the dramatic cliffs that are considered a paradise for climbing. A lighter, warm, high achiever thats the perfect addition for any moody grey scale colors. There will almost never be a project that doesn’t have room for a little ceramic touch. Ceramic proves that you don’t have to be a bold grey tone to be an important one. Whether undercoating, a feature color or part of an elaborate color concept. If you were to capture the majesty of birds of prey and be able to put that into a color, this color would be Buzzard. Its earthy warmness will enhance any project thanks to the inspiration of what mother nature already created. El Capitan is one of the most famous rock faces in the world renowned Yosemite National Park in California, U.S.A. If it ever needed a touch up, then Yosemite is the right color for the job. And a welcomed variation to the Montana GOLD grey scale colors. Asphalt is the sort of color that can make you look down at the road your driving on and appreciate on a whole new level. With the grey meter pitched up a notch, Asphalt starts to warm up and head towards the traditionally used, bolder grey tones. You can almost taste the cosmic dust as Meteorite assertively adheres itself within the color scheme of any project. A strong, decisive grey tone with an extremely broad spectrum of possible applications that can warm up the coldest of greys. The color Basalt could rapidly spread and solidify an image or project, just as its volcanic name sake would in nature. Whether applied in an explosive color scheme or used as a singular color on an object. Basalt is robust and timeless. Visit the product page to see all 215 available color tones of Montana GOLD artist paint!